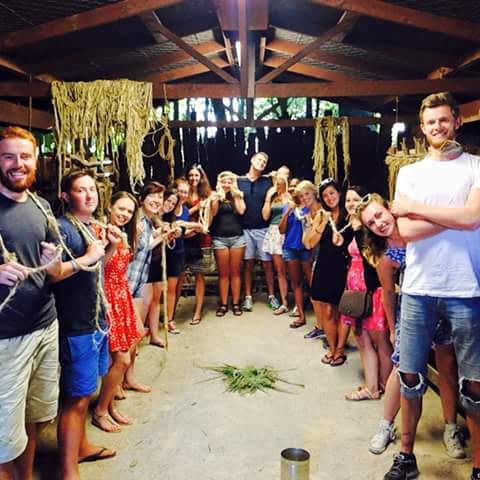 Rotarua and the Tamiki Mauri Village – Where's Walton? 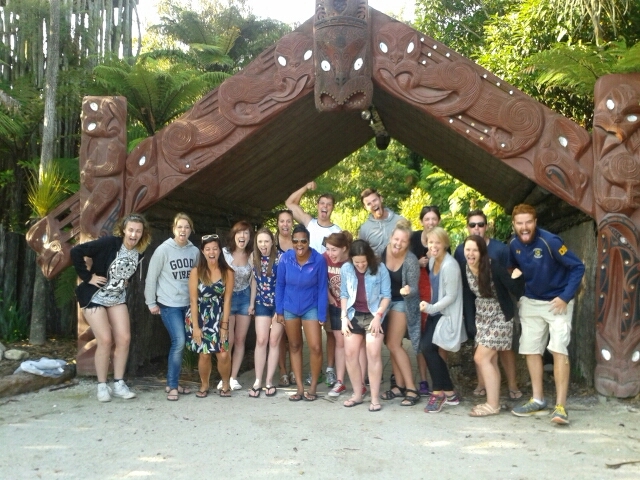 Rotarua is stop over three on our tour. 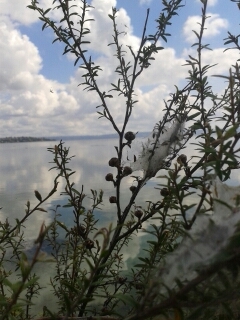 What struck us on arrival was the smell of rotting eggs in the air as we were driven around the town centre and around part of the lake, this smell is due to the sulphuric gases from the depths of the earth through the lake and bay. The stench faded when we got dropped off at our hostel but every now and then you still get a whaft of it in the air. Other than this the town seemed very nice and relaxed. 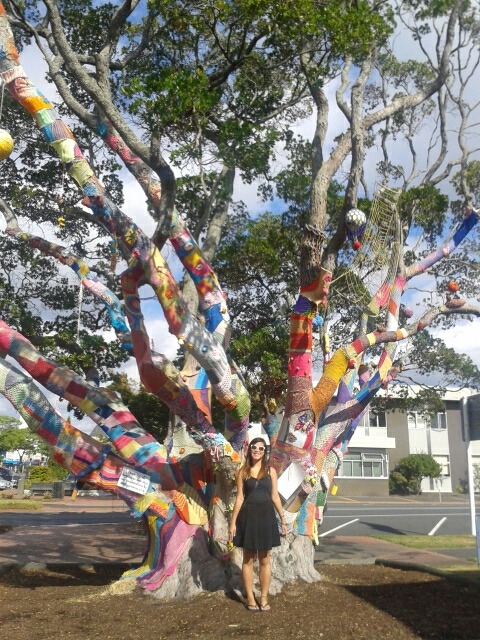 As we arrived at our hostel, we realised I had left our food bag on the kiwi bus. (You had one job Anne!!!) So I did a run do the Base hostel (where everyone else was staying) in hope that the bus was parked up. No such luck, it would return the next morning. At this point I was lucky Nici was having dinner at the Maori village that night and Bekki and I had noodles in our big bags or I’d be in trouble. Just a quick side note: If you are ever travelling New Zealand (or Australia), on a budget, then invest in one of these bags. It’s simply a cooler bag but it’s a good place to store everything and save on eating out. Our regular essentials are coffee sachets (saving me a fortune on take away coffees), seasoning (chilli flakes and pepper) and noodles (of course, it’s me). Then we just top up on meals. Just don’t leave them on transport!!! 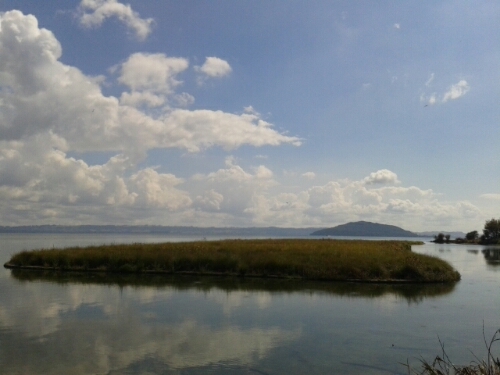 We had two nights in Rotarua. 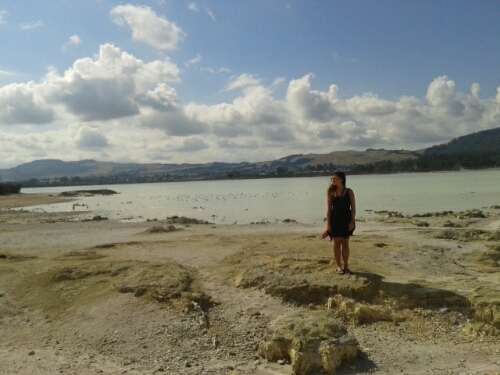 A night in Castle Palace hostel and the second an afternoon and stay over in the Maori village. We wandered around the gallery and also a sculpture exhibition with the theme of war. 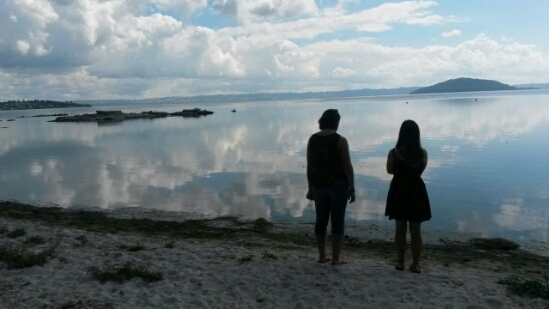 Then we found a trek around the lake… And we did not expect it to be as stunning as it was. It was so surreal walking through the forest and around the lake… it had a wintery frosty/icelantic feel but it was boiling hot. Absolutely beautiful! 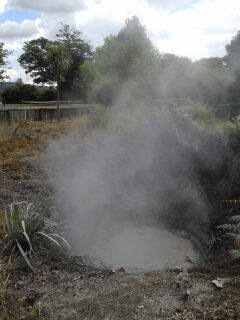 Then we took a walk over to the natural mud pools, all bubbling and steaming out smoke. 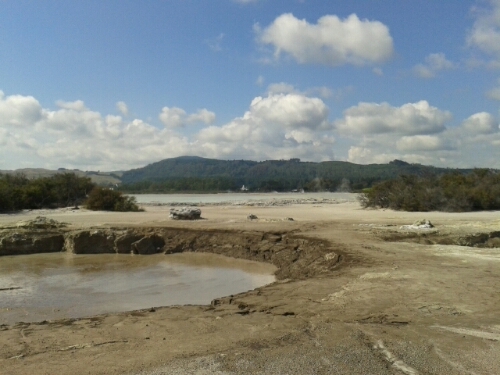 Apparently back in the 1800s you used to be able to bathe in the Cameron Hot Pools around Lake Rotarua but due to the Hydrogen sulphate and carbon dioxide, it emitted a gas similar to laughing gas, nitrious oxide. It made the pools dangerous as people kept passing out. 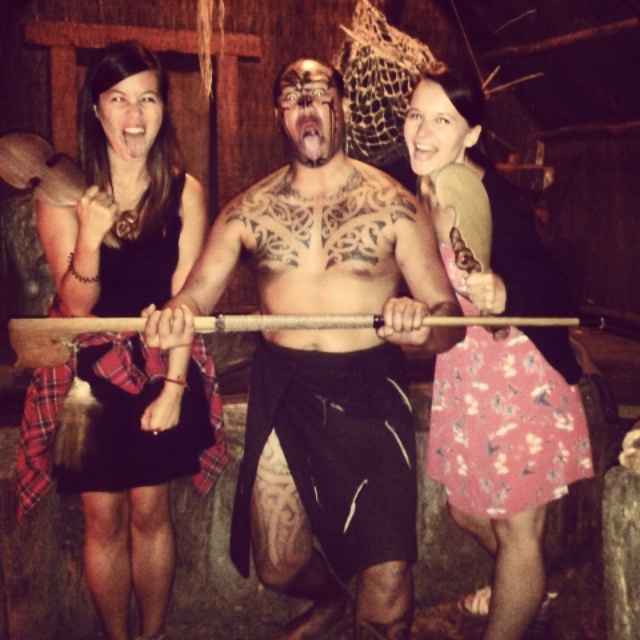 After this, Bekki and I prepared ourselves for our overnight stay at a Maori Village. 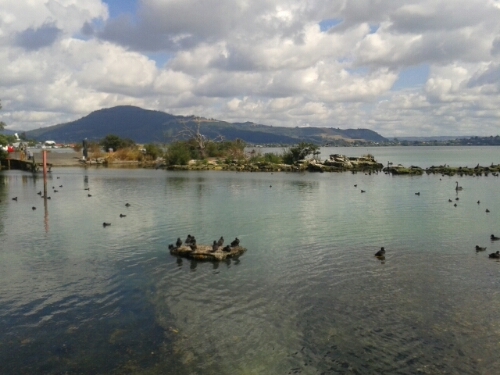 The Maori community are the indigenous ‘pre-european settlers’ in New Zealand before the British came over in the 1830s. 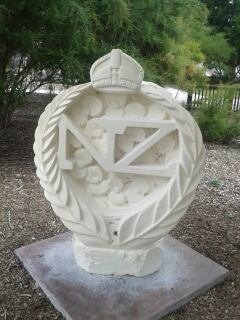 Now, on the north island they only make up 16% of the population. Many of you may know of the people from the famous Haka dance. Following this we were lead into a room with a table of cakes, tea and coffee… now this wasn’t the ‘tribal experience’ I was expecting but I don’t say no to afternoon tea! I filled my plate with a hot scone, carrot cake and shortbread cookie. 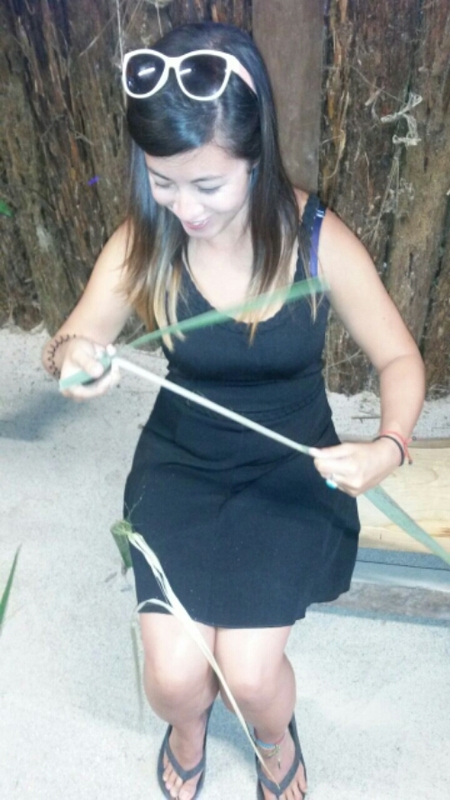 We then got down to some activities, firstly we learnt how to make rope from flax leaves by extracting the fibre and plaiting the strands. 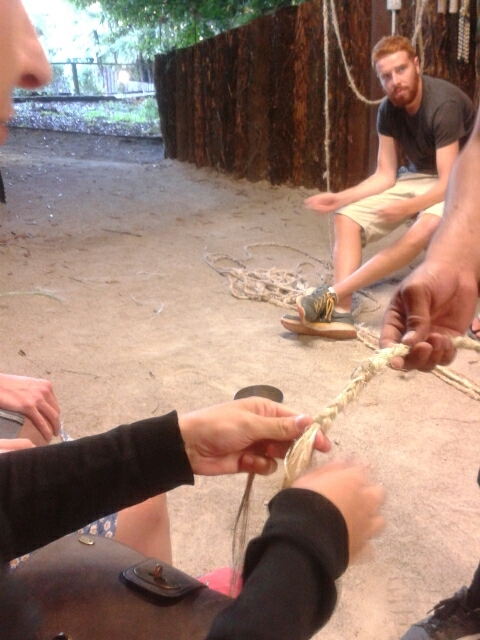 Every Kiwi bus that passes through the village adds their rope to an existing one which will remain and continue on in the village for years to come. 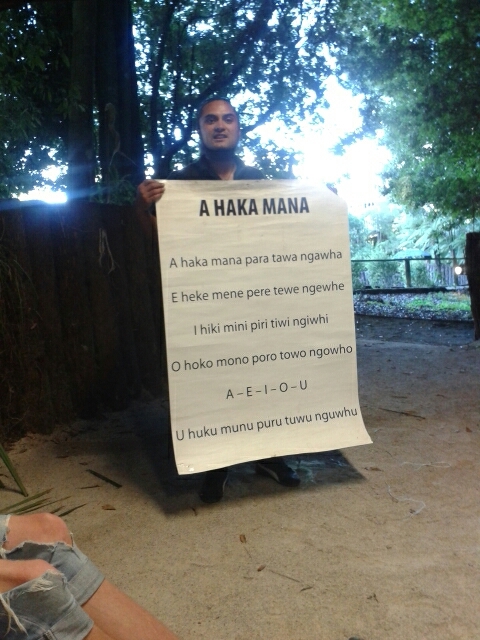 Then we learnt a Maori song that they teach to children to learn pronunciation of vowels. It’s in the tune of ‘stupid cupid’ and came with dance moves. We were to perform this after tonights dinner to 160 guests! 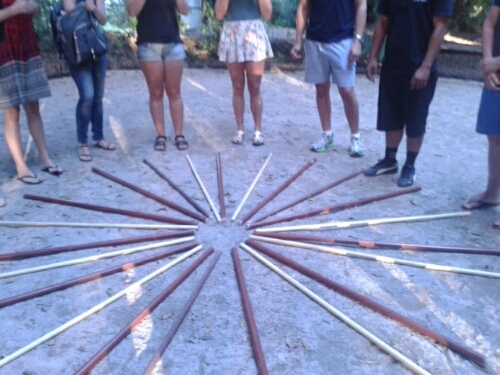 Lastly we played various games and challenges using long sticks. 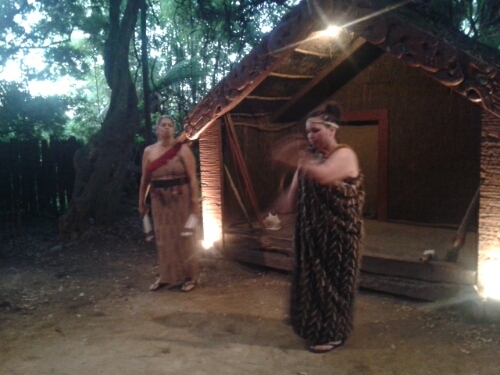 After this we joined the rest of the public for the evening part of the Maori experience. 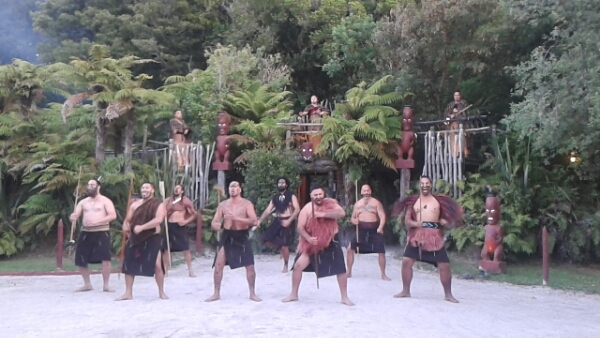 This includes a tribal Maori welcome, where you cannot smile and then you wander into the forest for more educational displays of various weapons, their tattoos and strength building tasks. 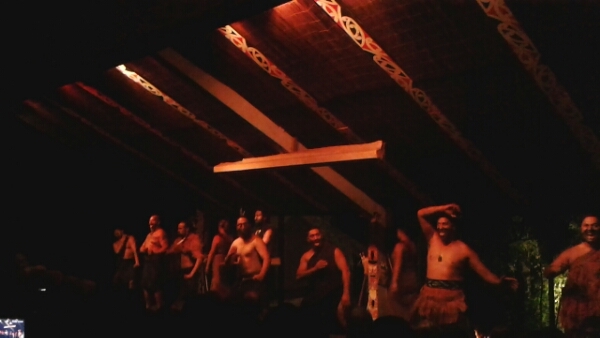 Men were also invited to learn the Haka. 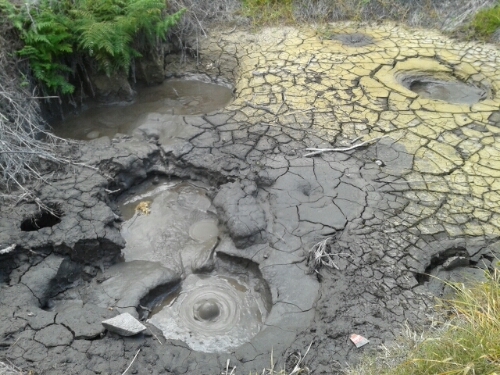 We then got to see how Maori’s would traditionally cook food/feasts via mud holes, then watched a musical performance by the whole team. This was incredible! Amazing talents and the singing was just fantastic. Before dinner we were shown a short DVD on the culture and how the Maori people came to terms with the British coming over. The evening ended with a fantastic roast feast (sorry no pictures, I was front of the queue for a real meal and desert -yes!!!) and the evening events ended with our kiwi group of about 20 performaning our little song. That night as the evening people left the village, the rest of us stopping over had hot tubs and a camp fire. As the group dived into the hot tubs, Bekki, Myself and our new friends Megan (from Milton Keynes – small world) and Dara (Ireland) proceeded to melt marshmallows around the fire to listen to some Maori stories for a couple of the performers from that evening. 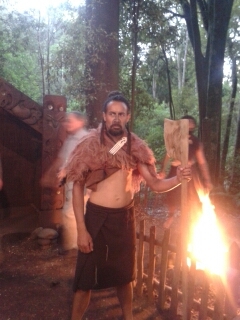 We were also joined by Mr Tamiki… the founder of the Tamiki Maori Village (a rare visit). He was keen to hear our feedback on the evening, it was all positive of course. 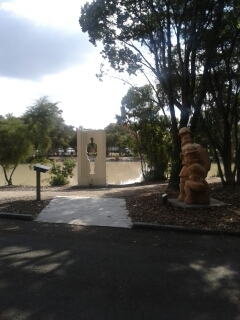 We were then free to ask him any questions about the village, Maori culture etc. As he discussed the meaning of life, importance of knowing your ancestory and the ancient land in Rotarua, I was just keen to know how well business was going and what marketing he was doing to promote the village… I think I’m starting to miss my job a little. But what I learnt from him and the performers working here that evening was how humble and down to earth these people are – this is very much a commercialised business to educate and entertain the public but they are so proud of their culture and only wish to share this beautiful ancestory with the modern world. The next morning as we drove away from the Mauri Village I felt so overwhelmed with happiness – I had just experienced something truly amazing. I can’t rate this experience enough. Pulling our best Haka faces!